ASH VS EVIL DEAD will have a vital (new) player to the world when the show debuts on Starz: Lucy Lawless. Starz has officially ordered AMERICAN GODS, the network announced. The series will be based on the Neil Gaiman novel. (And Gaiman will be an executive producer on the show.) Bryan Fuller and Michael Green will showrun the series. Starz is releasing five episodes of its upcoming documentary series, THE CHAIR, early to subscribers via Starz Play and Starz VOD. THE CHAIR is a unique series that follows the filmmaking process as two first-time directors attempt to make their own separate films — from the same script. 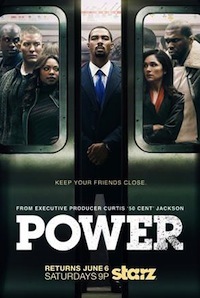 The series officially debuts on Starz on Saturday, September 6th at 11 PM. Will you be checking out THE CHAIR early?